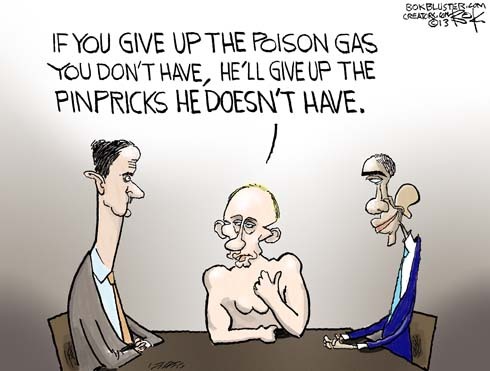 When it comes to irresponsible behavior in the 21st century Obama and Putin don’t see eye to eye. President Obama says no country can dominate another country. Dr. Krauthammer says Obama seems to think countries no longer have interests beyond those of the “international community”. Vladimir Putin’s answering machine explained he couldn’t come to the phone because he was digesting Crimea, python style. President Obama left a long message explaining “might doesn’t make right“. He promised not to send troops, not that anyone was asking. After he hung up, the president slapped sanctions on a few cronies (Putin’s not Obama’s). This gambit drew laughter. 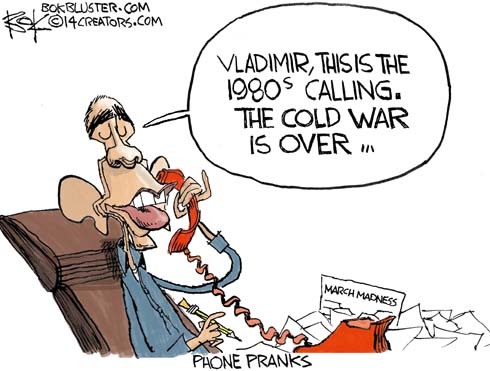 The Russians farted in our general direction, calling the sanctions a “prank“. President Obama thinks our biggest geopolitical foe is income inequality. No – wait – climate change. Mitt Romney thinks it’s Russia. 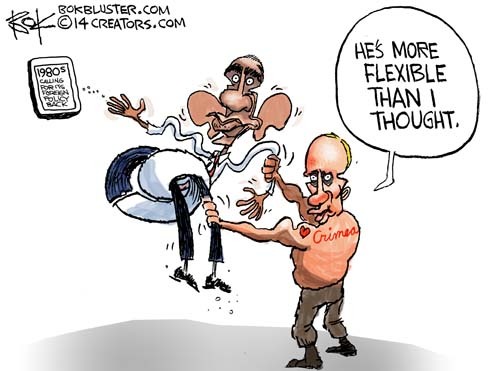 President Obama whispered in Dmitri Medvedev’s ear that, after the 2012 election, he could be flexible. In the final 2012 presidential debate Mitt Romney called Russia our greatest geopolitical threat. Obama mocked him by saying “the 1980’s is calling for its foreign policy back because, you know, the cold war’s been over for 20 years”. Looks like the 1800’s are on line 2. John Kerry’s response to Putin’s invasion of Crimea was that it was a “19th century act in the 21st century”. Light Brigade, report for duty. The president still insists this isn’t about some “cold war chessboard“. House Intelligence Committee Chairman Mike Rogers thinks it is, “Putin’s playing chess and we’re playing marbles”. FOR FIVE YEARS, President Obama has led a foreign policy based more on how he thinks the world should operate than on reality. It was a world in which “the tide of war is receding” and the United States could, without much risk, radically reduce the size of its armed forces. The Ukrainian government isn’t showing restraint; it is merely tragically impotent in the face of blunt aggression.. It used to be that defiance, not restraint, was considered the appropriate response to a foreign invasion”. Stephens thinks Obama invited Putin’s behavior by not seeing a connection to his capitulation to Putin on Syria. Then there’s also the failed Reset and abandoned missile defense for Poland and the Czech Republic. This is all a little much for Dana Milbank, also in the Post. He wants to know how Obama can be such a power grabbing, constitution shredding tyrant at home and a flexible weakling on the international stage. I think he has a point. I should have drawn the Flexible One wearing his crown. 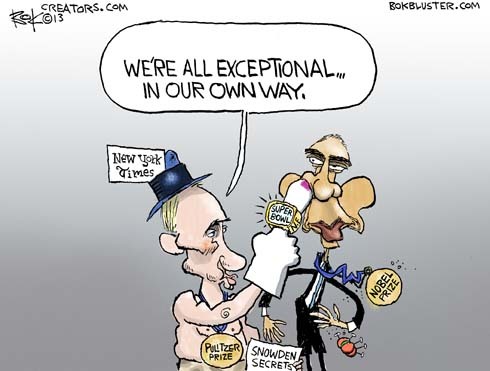 Putin wrote an op-ed in the NYT last week mocking Obama and the idea of American Exceptionalism. 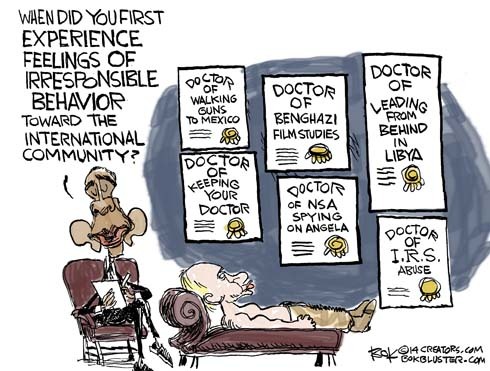 He scored bonus points because everyone knows Obama himself is not so wild about the idea. He thinks America is exceptional in the same way Britain and Greece are exceptional. Which is to say, not very. But that didn’t stop him last week from asking Americans to support an attack on Syrian president Assad – with something more than a pinprick, yet unbelievably small – because we are exceptional. The abuse continued this week when a Russian minister claimed the Navy Ship Yard shooting was an example of American Exceptionalism. When the going gets tough the weird get going. Syrian President Assad denied having chemical weapons until he agreed to John Kerry’s accidental offer to give them up. Now he denies doing so because of U..S. pressure. President Obama called for a “shot across Syria’s bow”. Secretary of State Kerry called for an “unbelievably small strike”. Then Obama proclaimed that the United States military does not do pinpricks. Not surprisingly, Putin has taken the leadership role in the Syrian crisis. He even has an opinion column in today’s New York Times to prove it.